Mission Beach is a stretch of beach between Mission Bay and the Pacific Ocean. Centrally located, this is San Diego's most popular beach with good reason. 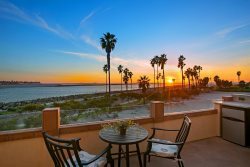 Miles and miles of ocean front and bay front boardwaks, sandy beaches, grassy parks, surfing, swimming, boating, jet skiing, dining, Belmont Amusement park, the Wave House.....Mission Beach has got it all!